Always start by cleaning with warm water and a cloth, or a microfiber cloth first. Spray with glass cleaner to clean off fingerprints. Use dish washing liquid and warm water to clean tougher stains and dirt. Use a stainless steel cleaner to remove stains if needed, but always read the directions and test a small spot on the appliance first. Wipe in the direction of the grain to avoid leaving streaks. Always towel dry after cleaning to prevent water spotting. Abrasive cleaners will scratch the surface and should always be avoided. Bleach will stain and damage stainless steel, do not use cleaning sprays or solutions that contain bleach. Dirty water and cleaning solutions can leave a residue that can stain and damage the surface, so don’t forget to rinse and dry. 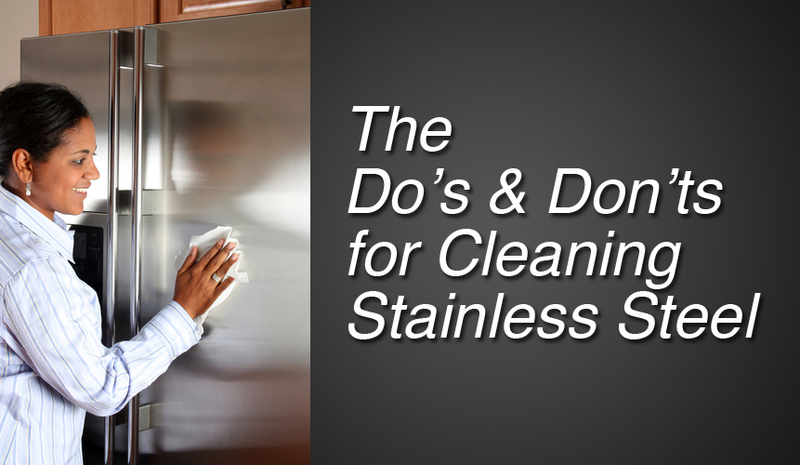 The keys to helping your stainless steel appliances avoid stains and corrosion is proper care and maintenance. With just a little effort, your appliances will stay looking shiny and new.